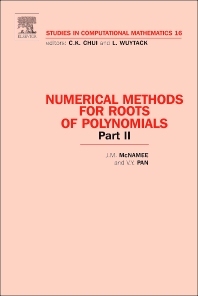 Numerical Methods for Roots of Polynomials - Part II along with Part I (9780444527295) covers most of the traditional methods for polynomial root-finding such as interpolation and methods due to Graeffe, Laguerre, and Jenkins and Traub. It includes many other methods and topics as well and has a chapter devoted to certain modern virtually optimal methods. Additionally, there are pointers to robust and efficient programs. This book is invaluable to anyone doing research in polynomial roots, or teaching a graduate course on that topic.